Q. We’re seeing very large black and yellow flying insects that look like wasps flying around our yard. They seem to be entering areas with piles of dirt along our walkway. 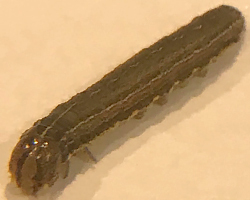 What are they and how do we get rid of them? Q. 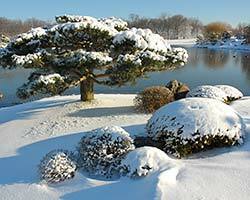 Should I remove snow from my shrubs? Q. What sort of spring care should I provide for my roses? 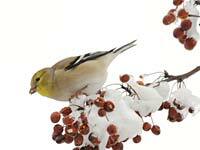 Q. I would like to attract birds to my garden this winter – any suggestions? Q. 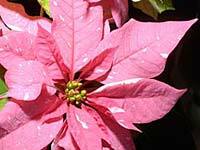 Are poinsettia plants poisonous? 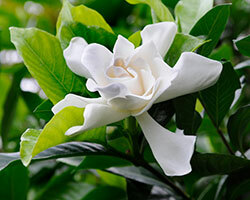 A.The term "poisonous plants" is often associated with plants that may cause great harm or be fatal if ingested. Potential poisoning depends on the level of toxins contained in the plant and the amount consumed. Q. How can I extend the life of cut flowers that I receive for Valentine’s Day? Q. I’ve noticed many leaves of my plants look chewed. What is causing this and is there anything I can spray to help my plants? A. 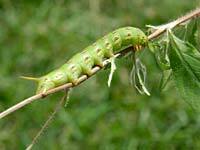 At this time of year, many different types of insects and their larvae frequently feed on the leaves of plants. 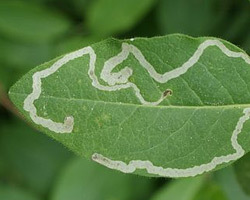 Without seeing the culprit, it is not possible to determine which insect is causing the damage to your plants. 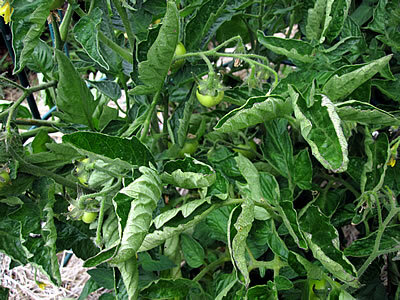 Inspect your plants thoroughly in order to positively identify the insect causing the damage. Q. What is the difference between June-bearing and ever-bearing strawberries? A. Types of strawberries are named according to their harvest time. June-bearing strawberries are the most familiar type and produce the largest fruits as well as large yields. 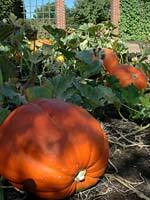 Ever-bearing plants produce two smaller crops, one in June and another in early fall. June-bearing varieties also produce larger numbers of runners than ever-bearing varieties. 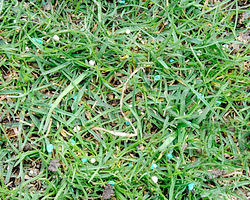 Q. We’ve noticed several wide, very green circles in the grass in our front lawn. Mushrooms are growing out of part of the circles. What are the rings and how do we get rid of the mushrooms? Q. Is there anything that I should be doing in March to my houseplants? Q. Why doesn’t my lilac bloom in the spring? A. 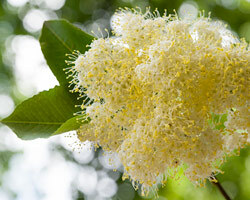 There are several possible reasons why your lilac fails to bloom. The most common cause is lack of adequate sunlight. 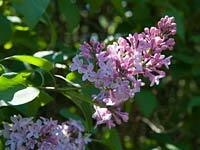 Lilacs (Syringa) need to be planted in a location that receives at least six hours of strong, direct sun per day. 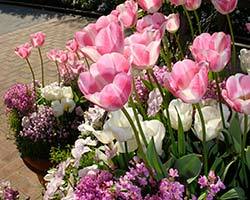 They are very tolerant of different moisture conditions as long as they are planted in well-drained soil. Q. How much water do plants need to keep them healthy? A. The amount of water plants need depends on several different factors, like type of plant, how long it’s been planted, type of soil, and location. Q. We are thinking about getting a live, not cut, holiday tree this year. Q. How can I use fallen tree leaves in my garden? 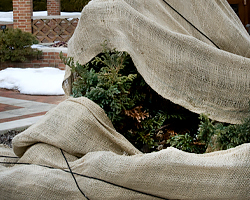 A. Shredded leaves can be used to insulate various plants in the garden during the cold winter months. When leaves are used whole they can prevent water from penetrating the root zones of plants; therefore, it is important to shred them first. If only a small amount is needed, whole leaves can easily be shredded in a garbage can using a weed whacker. It is always a good idea to wear safety goggles when using a weed whacker. 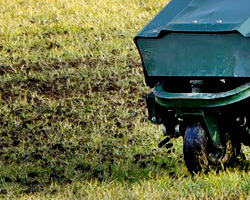 If a larger amount is needed, a lawn mower can be used. Q. Is there anything that I can do to prepare my trees and shrubs for winter? Q. 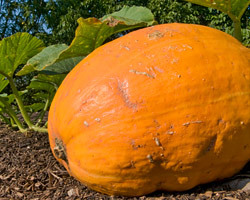 How do I know when my pumpkins are ready to harvest? Q. 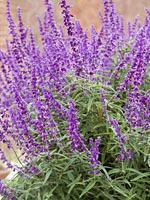 Do you have any suggestions for plants that can be used in a fall container? Q. My perennial salvia plants have already bloomed and are now leggy, open, and straggly. Why are they doing this and can I do anything about it? Q: What types of sprinklers should I be using in my garden? A: There are many types of irrigation devices with distribution patterns to fit different watering needs. Hand-held devices or watering cans are the easiest to use for containers or specimen plants that may require higher amounts of irrigation. Screw nozzles and pressure grips with triggers are available to distribute water in a variety of ways that range from full stream to fine mist sprays. Q: My trees and shrubs struggled this year because of the drought. Will my plants recover? A: Many plants are showing signs of distress this year due to the drought and extreme temperatures. Scorch, browning of leaves, leaf drop, and premature fall color are commonly seen due to this year’s weather conditions. Many plants seem to be perking up with the recent rains; however, significant damage may have already occurred. 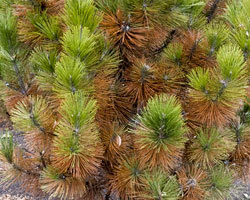 Young, not yet established plants, i.e., less than 3 years old, are at greatest risk of suffering long term damage. 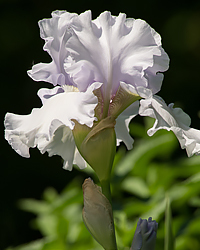 Q: I'd like to divide and store my Iris plants for the winter. What is the best way to do this? 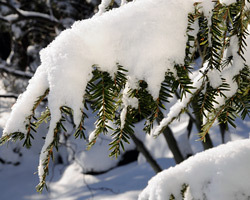 Q: Every winter the snow damages some of my shrubs. Is there anything I can do to prevent this? Q: We would like to give plants as gifts during the holidays but aren’t sure how to transport them. 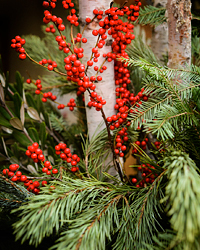 Do you have some tips for purchasing and transporting holiday plants? 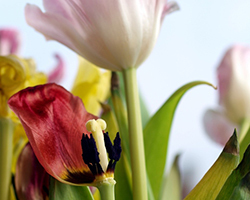 Q: I am storing summer bulbs for the first time — is there anything I need to do for them during the winter? Q: I’ve read a lot recently about heirloom vegetables and would like to try growing some this year. 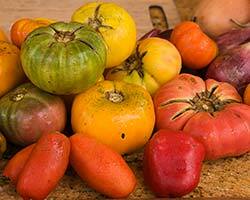 Can you explain a little about heirlooms? 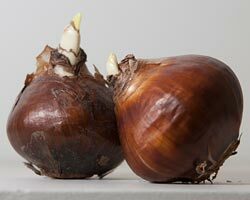 Q: In the fall, I always have trouble remembering where I need to plant bulbs in my garden, and often find myself planting too close to existing ones. Any suggestions? Q: Last year my mums grew tall and spindly. Is there something I can do to prevent this from happening again this year? 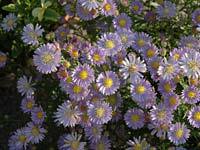 A: Hardy chrysanthemum plants can grow 1 to 3 feet tall, depending on the cultivar, with a spread sometimes equal to the height. To keep them growing optimally, they should be planted in a full-sun location that receives at least six hours of direct sun per day. 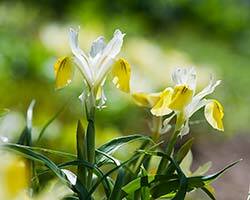 Plants requiring full sun that are planted in shady areas will often stretch for more sunlight and grow straggly. The soil should be well-drained and kept slightly moist. How do I get perennials to bloom all summer? Q: Some of my perennials that bloomed in late spring and early summer were beautiful! Will they bloom again? 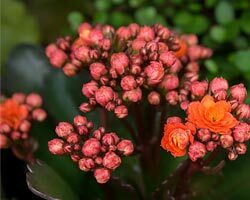 A: Many perennials can be encouraged to rebloom by selectively pruning after a plant's initial flush of blooms. 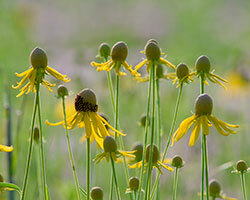 Perennials such as Tickseed (Coreopsis) will bloom all summer with continual deadheading of the spent flower and stem. 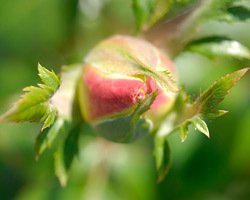 Read more about How do I get perennials to bloom all summer? 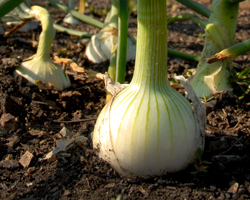 Q: Are there any vegetables that I can grow this late in the season? A: There are many different vegetables that can be planted in late summer and early fall providing unusually high temperatures don't persist. Warm weather can cause certain vegetable crops, such as head lettuce and spinach, to flower and set seed prematurely, which is called bolting. 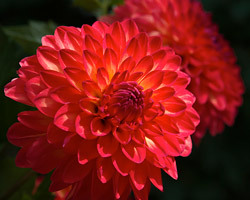 Q: There are so many beautiful varieties of mums at this time of year. They are supposed to be perennial, but I lose them over the winter. Is there a trick to get mum plants to overwinter? Q: I'd like to give plants as gifts for the holidays. 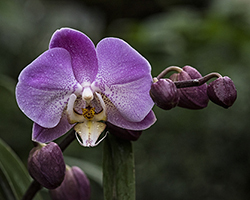 Many gift plants are treated as short-lived houseplants because they are difficult to get to rebloom or keep alive and are discarded. 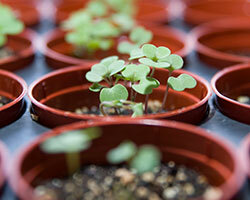 Can you recommend plants that are easy to grow and that will last more than one season? Q. I didn’t get around to planting my spring-blooming bulbs last fall. What should I do with them? Q. 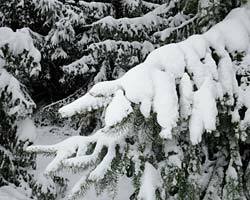 As the snow in my garden melts, there appears to be something wrong with my evergreen shrubs. They look broken and trampled. Is this snow damage and what can I do about it? Q. Do I need to prune my roses in spring? A. 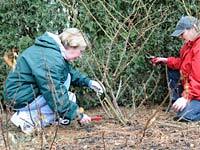 Early April, or when the forsythia begins to bloom, is a good time to assess how your roses came through the winter, and to determine what their pruning needs might be. 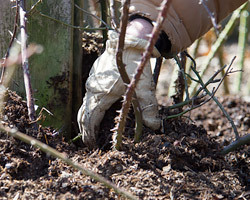 Many roses require minimal pruning at this time, primarily to remove dead or winter-damaged wood, whether that is the tip of a cane, or in some cases, the entire cane. Q. 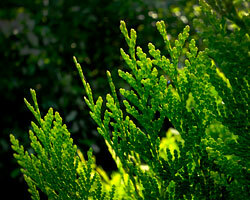 As plants in my garden begin to green and produce new growth, I've noticed that some of my evergreens are very brown. Is this a disease? What should I do? Q. 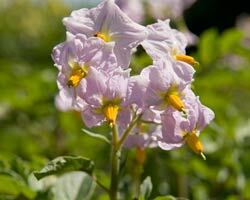 Is it too late to plant potatoes? Q. I've noticed that leaves of my plants look chewed. What is causing this and is there anything I can spray to help my plants? 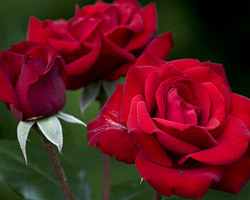 Q: Is there anything I should do now to prepare my roses for winter? A: Discontinue the fertilization of roses by the first week of August, approximately. Without supplemental fertilization, the plants will begin to shut down for the summer and will begin the process of storing nutrients to best survive the harshness of winter. Q: I have a lot of Creeping Charlie weeds in my lawn. When is the best time to apply a weed killer? 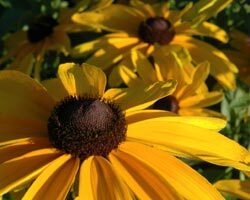 Q: Should I cut back my perennials to prepare them for winter? If so, when? 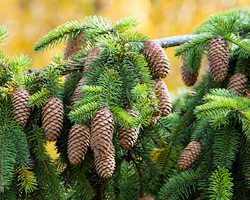 Q. I recently noticed many discounted evergreens at local garden centers. Is this a good time of the year to plant them? Q. 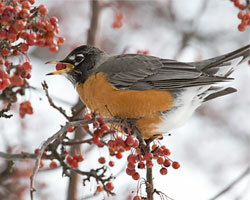 How can I protect my trees and shrubs from animal damage in the winter? Q. 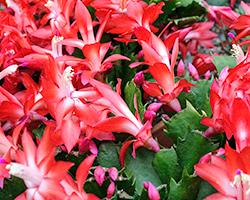 How should I care for my Christmas cactus when it stops blooming? 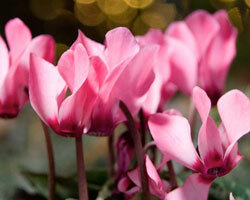 Q. I received a cyclamen plant as a Valentine’s Day gift. How do I take care of it? Q. I noticed roots showing around some of my perennials. Is this normal? Is there anything that I should do about it? 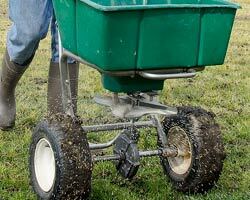 Why is phosphorus, a component of lawn fertilizer, bad for the environment? 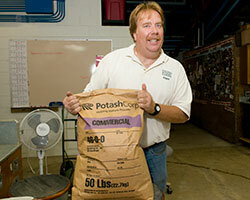 Phosphorus is a component of most fertilizers that helps plants to grow. When too much is applied or is applied at the wrong time—such as right before it rains—most of it is washed away and ends up in the local waterways. This type of pollution is called nonpoint source pollution. It causes eutrophication (a reduction of dissolved oxygen in water bodies caused by an increase of minerals and organic nutrients) of rivers and lakes. This reduced level of oxygen in water ends up suffocating fish. 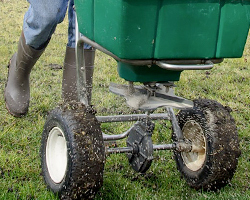 Read more about Why is phosphorus, a component of lawn fertilizer, bad for the environment? Do you have any gardening gift ideas for Mother's Day? A: Moms who are avid gardeners always appreciate gifts that make their lives easier or add beauty to outdoor spaces. Cut flowers are gorgeous but short-lived, so how about giving live plants? A rosebush or a potted miniature rose can be enjoyed indoors and later planted in the garden. Moms who like to cook will welcome a pretty container of fresh herbs such as basil, parsley, rosemary, thyme, sage, and oregano. Hanging baskets with colorful blooms always brighten up a spring garden. 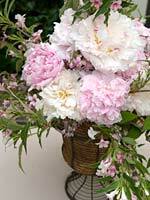 Read more about Do you have any gardening gift ideas for Mother's Day? Q. What is the correct height to mow a lawn? Q. 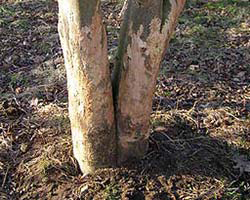 Is it true that some viburnums will not be affected by the viburnum leaf beetle? Q: On a recent camping trip, I saw signs saying, “Take only memories and leave only footprints.” What exactly does that mean and why is it important? Q. I already fertilized my lawn in the spring. Should I do it again in the fall? Q. Is there is anything I can do now in the garden to make next spring’s work easier? Q. 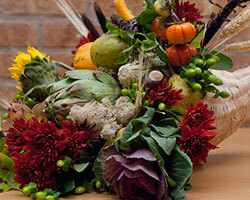 Do you have any tips on making a fall centerpiece? A. Build your own cornucopia with our Cornucopia 101 by Nancy Clifton! Read more about Q. Do you have any tips on making a fall centerpiece? Q: I’d like to give a creative and unusual gift. Do you have any suggestions? A. Tillandsia plants, commonly called air plants, can be used quite creatively, and many different species are available. 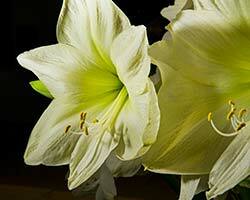 They will last longer than many plants sold this time of year, and they are relatively inexpensive. 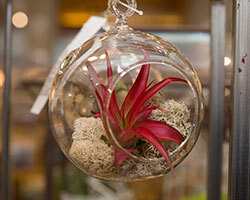 Tillandsia make great holiday, teacher appreciation, or hostess gifts. Read more about Q: I’d like to give a creative and unusual gift. Do you have any suggestions? 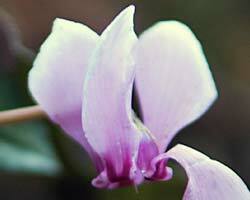 Q. I received a cyclamen as a gift, and I’m not sure how to take care of it. Q. My Phalaenopsis orchid just finished blooming and I’m not sure what to do with the flower stem. Do I cut it? If so, where? 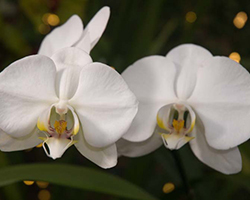 Q: How do I water my orchid? Q. What can I do now to care for my established roses? Q. 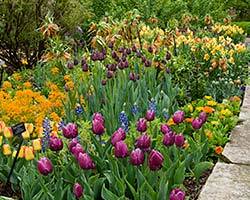 When should I plant my tender annual bulbs? Why is my hosta foliage turning brown? A. The cool, damp, cloudy spring we had this year is conducive to many fungal infections. Some of the more common fungal problems affecting hostas are anthracnose and botrytis. 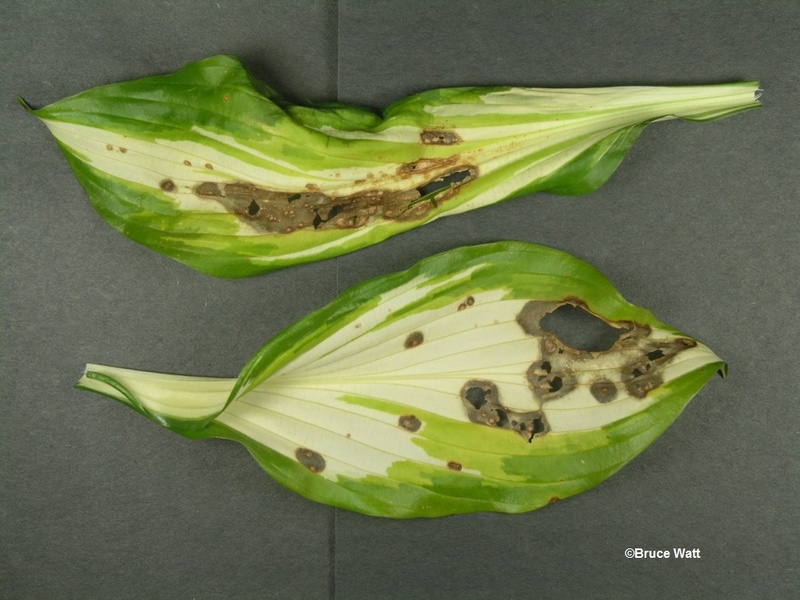 This season, Plant Information has seen many cases of hostas infected with botrytis, which can be prevalent in cool, wet weather. Botrytis on hosta first appears on foliage as water-soaked spots that begin small and increase in size. 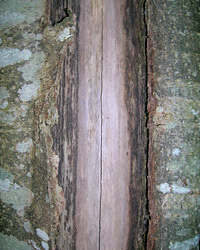 As the spots enlarge, cinnamon to dark tan rings can sometimes be seen within the lesions. 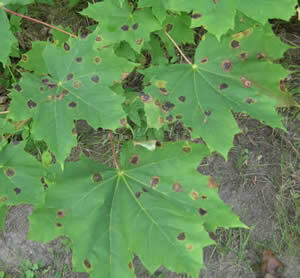 Lesions can also travel down to the petiole of the plant. Read more about Why is my hosta foliage turning brown? Q. Last year, my tomato plants didn’t produce as much fruit as in past years. Why is this and is there anything that I can do about it? 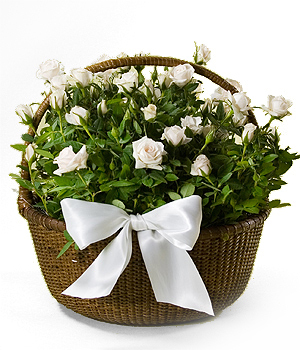 • Sometimes flowers drop off the plant during periods of fluctuating temperatures. Temperatures above 90 degrees Fahrenheit during the day can cause the blossoms to drop without setting fruit. 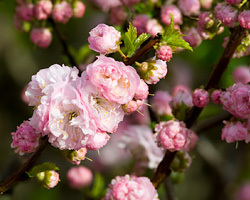 If evening temperatures fall below 55 degrees, remain above 75 degrees, or if the humidity is too high, blossoms can also drop prematurely. Q. I noticed that the maples in my neighborhood have black spots on them. Are the trees sick? Q. 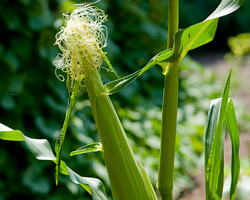 When is the best time to harvest sweet corn and how do I do it? Q. How do I select a good carving pumpkin for my family? Q. 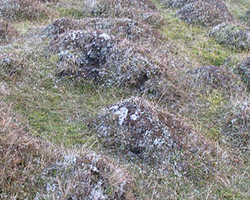 Is there anything I can do now to prepare my turf for the winter? 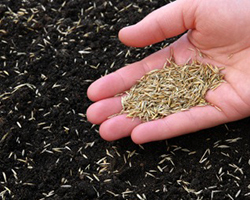 A.Fall is a good time to improve the health of your lawn and prepare it for winter. There are a number of cultural practices that will help at this time of year. 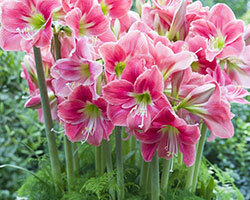 Q: How do I take care of my amaryllis now that it’s bloomed? Q. I found some stored seeds from previous years. Can I use them this growing season? Q. How do I force spring-flowering branches indoors? 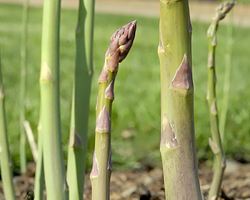 Q. I would like to grow asparagus. How do I get started? Can I transplant a potted miniature rose? Q. I received a potted miniature rose for Mother’s Day. Can I transplant it into my garden? Read more about Can I transplant a potted miniature rose? 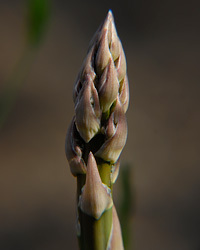 Q. I planted asparagus a few years ago. When and how do I harvest it? Q. When and how do I divide irises? I received a gardenia plant as a gift. How do I care for it? How do I reseed my lawn? Q. Are there any houseplants that should stay outdoors in the fall to promote bud formation? Q. 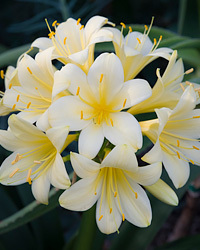 How do I take care of my clivia plant in order to get it to rebloom next year? Q. 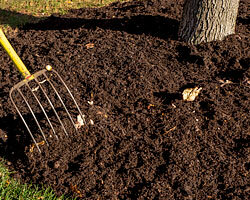 How do I mulch in preparation for the winter? Q. 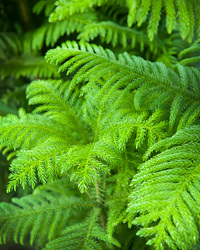 How do I care for a Norfolk Island pine? 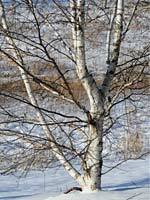 Q. I have noticed frost cracking on my sycamore. What, if anything, should I do about it? Q. I have seen corn gluten meal sold as a pre-emergent herbicide. What can you tell me about it? Q. 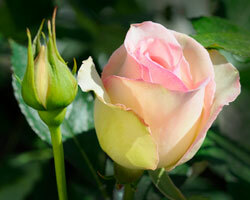 When and how should I plant bare-root roses? Q. 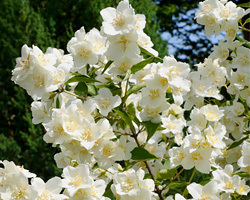 When should I prune my mock orange (Philadelphus coronarius)? Q. 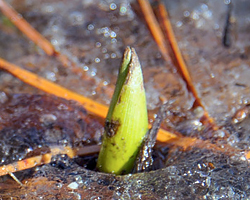 What do I do with my spring-flowering bulbs after blooming? 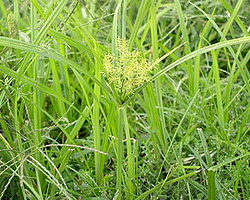 Q. I think I have yellow nutsedge (Cyperus esculentus) in my lawn. How do I get rid of it? Q. We suddenly have a large number of dark caterpillars on our lawn. What are they and how do we control them? 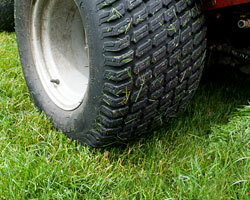 Q. I read that good lawn maintenance involves aeration. Exactly what is this and when should it be done? Q. 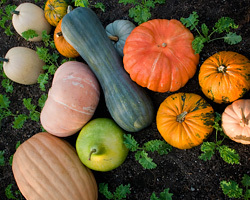 How do I harvest gourds? Q. 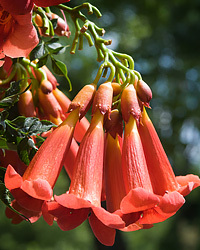 How and when should I prune my trumpet vine (Campsis radicans)? Q. How do I keep cut greenery fresh indoors for the holidays? Q. I have evergreens planted near a street. How can I protect them from salt damage? Q. After a few warm days, some of my bulbs are sprouting prematurely. Will this hurt the bulbs or future blooms? Q. The recent cold and snow have me dreaming of fresh produce from my veggie garden. What can I plant in March? Q. My arborvitae and smaller evergreens have bent under the weight of this winter’s ice and snow. Is there anything I should do to straighten them?